Sudden unexpected infant deaths (SUIDs) are deaths in infants younger than 12 months of age that occur suddenly, unexpectedly, and without obvious cause. Sudden infant death syndrome (SIDS), the leading cause of SUID in the United States, is diagnosed only after a thorough investigation of the scene, interview of caregivers, and a complete forensic autopsy. Development of Emergency Department guidelines for the reporting and evaluation of SUID, in collaboration with the local medical examiner and child death review teams, will enable ED practitioners to collect important information in a compassionate manner that will be valuable to the investigating personnel. The image below illustrates the incidence of SIDS in the United States, 1985-2008. Depiction of changes in sudden infant death syndrome (SIDS) incidence in United States before and after "Back to Sleep" campaign. Line plot (secondary y-axis) depicts combined proportion of infants placed for sleep in supine and side-sleep positions, as determined by annual federal telephone survey of infant sleep position. AAP = American Academy of Pediatrics; NICHD = National Institutes of Child Health and Human Development; NISP = National Infant Sleep Position. SIDS should not be used as an emergency department diagnosis. It is more accurate to use “Sudden Unexpected Infant Death” if there is no external evidence of injury to the infant and no scene information to suggest another cause of death. To confirm the diagnosis of SIDS, a complete forensic autopsy needs to be performed, using information gathered from the scene investigation, interview of caregivers and review of medical and social history. After a thorough case investigation, some of these SUIDs may be explained. Poisoning, metabolic disorders, hyper- or hypothermia, child abuse and neglect resulting in homicide, and suffocation are all explainable, but much less common, causes of SUID. The medical examiner’s diagnosis of SIDS is one of exclusion. Recently the pathological diagnosis of SIDS was revised by an expert panel of pediatric and forensic pathologists and pediatricians; they developed a new, general definition of SIDS for administrative and vital statistics purposes. Another category, unclassified sudden infant deaths, was introduced for cases that do not meet the criteria for a diagnosis of SIDS and for which alternative diagnoses of natural or unnatural conditions were equivocal. Live patients may be seen following a brief resolved unexplained events (BRUE, formally called apparent life-threatening event ALTE). BRUE survivors share many risk factors for SUID; however, debate exists as to whether BRUEs are interrupted SUIDS events, separate phenomena, or SUIDS-related events. After a BRUE, many patients present to the emergency department (ED) in no acute distress. In 50% of these infants, physical examination is entirely normal. Pyrexia is documented in 25% of patients, infection in 25%. Did the infant have a foreign body, trauma, or ingestion? Does the infant have a history of apnea? What activity did the infant exhibit before the BRUE? What was the time and amount of the last meal? Was the baby asleep or awake? What was the child’s position? What was the period of apnea (in seconds)? Did the infant change color? What was the baby’s tone (eg, limp, stiff, or shaking)? What was the duration of the event? What was done (eg, cardiopulmonary resuscitation [CPR]), and how was it done? The classic presentation of SIDS begins with an infant who is put to bed, typically after breastfeeding or bottle-feeding. Checks of the baby at varying intervals are unremarkable, but the baby is found dead, usually in the position in which he or she had been placed at bedtime or naptime. Although most of infants are apparently healthy, many parents state that their babies "were not themselves" in the hours before death. Care should be taken at the scene of death to examine for signs of environmental factors that may have contributed to the death. Transfer is indicated if inpatient facilities are not available to meet the patient’s needs for monitoring and critical care. Sudden infant death syndrome (SIDS) is defined as the sudden death of an infant younger than 1 year that remains unexplained after a thorough case investigation, including performance of a complete autopsy, examination of the death scene, and a review of the clinical history. Cases that fail to meet this definition, including those without a postmortem investigation, should not be classified as SIDS; cases that include autopsy and careful investigation but remain unresolved may be designated as undetermined or unexplained. Some changes in terminology have occurred. Sudden unexpected infant death (SUID), has been used as an umbrella term under which “pure” SIDS would fall (eg, the unexpected death of a supine sleeping infant in whom the autopsy reveals no lethal lesion and the death scene investigation excludes potential asphyxiating stressors). The unavailability of a universally accepted classification scheme poses challenges for researchers, clinicians, and aggrieved families. The sudden demise of an infant, thankfully, is not a common occurrence. SIDS predominates as the single leading cause of unexpected deaths in infancy; however, alternative diagnoses are identified in as many as 15-25% of SUIDs. In most series, SIDS accounts for 35-55% of deaths within the postneonatal period (ie, age 1 month to 1 year). Despite intensive study and advances in the understanding of associated factors, the specific cause or causes of SIDS remain unknown. The diagnosis of SIDS is one of exclusion and thus should be demystified, with the specific evidence in each infant death subject to careful and complete examination. Although death from SIDS is much more common than death from child abuse, the possibility of homicide, nevertheless, is an omnipresent etiologic overlay. Presentation of an infant with a life-threatening event thus creates many unique challenges for emergency physicians and has a high potential for producing cognitive dissonance. Elicitation of the history of present illness, vital to every workup, may reveal inconsistencies that raise the suspicion of human agency as the underlying cause of the infant’s condition. Physical examination directed toward the identification of medical problems may reveal evidence of intentional trauma. Treatment of physiologic instability must be conducted simultaneously with efforts aimed at identifying and preserving potential physical evidence. Even emotional support of the parents, which is integral to comprehensive medical management and compassionate medical practice, should be carried out in a manner that does not compromise possible subsequent legal proceedings. Informing parents of the death of a child is cited as the most stressful experience physicians confront in emergency settings. These events often are compounded by feelings of guilt and inadequacy, which many physicians experience after an unsuccessful pediatric resuscitation. These reactions may be markedly different, qualitatively and quantitatively, from the emotions generally experienced in other crises. Death occurs when vulnerable infants are subjected to stressors at times when normal defense mechanisms may be structurally, functionally, or developmentally deficient. The triple-risk model allows for the possibility of multiple stressors and for heterogeneous underlying vulnerabilities that manifest as SUID. Epidemiologic data suggest that genetic factors play a role, and many studies have attempted to identify SIDS-associated genes. A copious literature implicates various genes, encoded proteins, and signaling pathways in the pathogenesis of SIDS, including central nervous system (CNS) pathways, cardiac channelopathies, immune dysfunction, metabolic pathways, and nicotine responses. Although both prolongation of the QT interval (long QT syndrome [LQTS]) and shortening of the QT interval (short QT syndrome [SQTS]) are associated with increased risk of cardiac arrhythmia and sudden death, it is QT prolongation that has received the greatest attention in SIDS. Clinically, these dysrhythmias may present as syncope, seizures, or sudden cardiac death. According to conservative estimates, 30-35% of infants who subsequently die of SIDS have prolongation of the QT interval in the first week of life. The QT interval is heart rate−dependent and is calculated according to Bazett’s formula. Prolongation of the corrected QT interval (QTc) is a marker of reduced cardiac electrical stability and is strongly associated with SIDS. Some clinicians consider the QTc to be prolonged when it exceeds 440 msec; others consider it to be prolonged when it exceeds 450-475 msec. The QTc increases during the second month of life but returns to values recorded at birth by the sixth month. These findings are derived from a large prospective study of infants born over a 19-year period, and another study, which together examined more than 40,000 infants. The odds ratio for SIDS among all infants with prolonged QTc was 41:1; for boys, the odds ratio was approximately 47:1. Prolongation of the QTc may act as an arrhythmogenic substrate that requires other postnatal factors to trigger development of life-threatening arrhythmias. The trigger is usually a sudden increase in sympathetic activity, which, during the first year of life, may have a number of causes, including sudden noise, apnea leading to a chemoreceptive reflex, exposure to cold, and rapid eye movement (REM) sleep and arousal. Developmental alteration in cardiac sympathetic innervation is one hypothesis proposed to explain QTc prolongation. Such innervation continues after birth for approximately 6 months. Occasionally, right and left sympathetic nerves develop at different rates, creating a temporary neural imbalance. During this stage, a sudden increase in sympathetic activity may cause a lethal arrhythmia in these electrically unstable hearts. This is most commonly the torsades de pointes variant of ventricular tachycardia, due to early after-depolarizations. A second hypothesis proposes a variant of congenital LQTS. Patients with this syndrome are at high risk for sudden death, especially under conditions of stress, but also during sleep. A long-term prospective study, involving 34,442 newborns over an 18-year period, explored the relation of QTc prolongation to SIDS. Within this large cohort, 24 infant deaths occurred that were attributed to SIDS. Twelve of the 24 infants exhibited prolongation of the QT interval on their newborn electrocardiogram (ECG). The authors suggested that these deaths might have been preventable with medications (beta-blockers) known to suppress the development of the fatal dysrhythmias associated with QTc prolongation. Although other traditional SIDS risk factors (eg, prone sleeping position, maternal smoking, and bed sharing) have odds ratios markedly lower than that observed with QTc prolongation, the American Academy of Pediatrics considers it unlikely that this electrical irregularity explains more than a small minority of SIDS cases. Future studies will help to determine whether targeted or population-based screening for QTc prolongation among newborns is the best evidence-based strategy. Definitions of these terms (see below) are based on those promulgated by the National Institutes of Health Consensus Development Conference on Infantile Apnea and Home Monitoring, supplemented as noted. A BRUE (previously called apparent life-threatening event) is frightening to observe and is characterized by some combination of apnea (central, occasionally obstructive), color change (usually cyanotic or pallid, occasionally erythematous or plethoric), marked change in muscle tone (usually limpness), choking, or gagging. In some cases, observers fear the infant has died. BRUE survivors share many risk factors for SIDS and are at increased risk for the syndrome; however, debate exists as to whether BRUEs are interrupted SIDS events, separate phenomena, or SIDS-related events. The estimated frequency of BRUE among healthy term infants is 1-3%. A potential relation between SUID and BRUE is suggested by the observation that the risk of subsequent death among infants experiencing a BRUE is 1-2%. The risk increases to 4% for infants whose BRUE is associated with respiratory syncytial virus (RSV) infection and rises to 8-10% for infants who experience BRUE during sleep or require some form of cardiopulmonary resuscitation (CPR). Among infants with SIDS, only 5% have a history of a BRUE preceding the death. Approximately 25-30% of BRUEs remain unexplained even after a thorough evaluation. The most conditions commonly associated with BRUE include gastroesophageal reflux disease (GERD), lower respiratory tract infection (bronchiolitis), pertussis, urinary tract infection (UTI), respiratory control disorder, and seizure. Less common causes include cardiac dysrhythmia (LQTS), anemia, structural CNS anomaly, and cardiac or airway anomaly. Periodic breathing is a breathing pattern in which 3 or more respiratory pauses of more than 3 seconds’ duration are separated by less than 20 seconds of respiration between pauses. This breathing pattern can be normal. Pathologic apnea involves an abnormal pause in respiration. A respiratory pause is abnormal if it is prolonged (>20 sec) or if it is associated with cyanosis; abrupt, marked pallor; hypotonia; or bradycardia. Apnea of prematurity is characterized by periodic breathing with pathologic apnea in a premature infant. Apnea of prematurity usually ceases by 37 weeks’ gestation (postmenstrual dating) but occasionally persists for several weeks past term. Apnea of infancy is characterized by an unexplained episode of cessation of breathing for 20 seconds or longer or by a briefer respiratory pause associated with cyanosis, pallor, marked hypotonia, or bradycardia. This term is generally applied to infants who are older than 37 weeks’ gestational age at the onset of pathologic apnea. Typically, their BRUEs are idiopathic but are considered to be related to apnea. Accordingly, the apnea of infancy classification is generally reserved for those infants for whom no specific BRUE cause can be identified. Several anatomic and physiologic findings support the role of apnea in SIDS. SIDS, despite its name, is not always sudden. Meny et al reviewed data from 6 infants who died while on home monitors. Of the 6 deaths, 3 were ascribed to SIDS. All SIDS patients had bradycardia that preceded (n = 2) or occurred simultaneously with (n = 1) central apnea; 1 had tachycardia before bradycardia. The monitor printout of 1 patient showed a slow decrease in heart rate for about 2 hours before death. One infant who had rapid CPR could not be revived, which suggested that myocardial depression secondary to hypoxemia may have preceded the bradycardia. Other evidence also implicates hypoxia (acute and chronic) in SIDS. Hypoxanthine, a marker of tissue hypoxia, is elevated in the vitreous humor of patients who die of SIDS as compared with control subjects who die suddenly. This adds biochemical support to the concept that in some cases, SIDS is a relatively slow process. In addition, a number of infants who die of SIDS manifest necropathologic evidence of chronic hypoxia, including changes in the bronchiolar walls, pulmonary neuroendocrine cells in the lungs, and elevated fetal hemoglobin levels. Alveolar hypoxia stimulates pulmonary vasoconstriction and, eventually, pulmonary vascular smooth muscle cell hyperplasia. Muscularity of the pulmonary vasculature causes pulmonary vasoconstriction, increased right ventricular afterload, and heart failure with more tissue hypoxia. Arterial hypoxemia and ischemia result in astrogliosis of the brainstem, which promotes hypoventilation and further astrogliosis. The latter stages of asphyxia are triggered when arterial oxygen tension (PaO2) falls toward zero. Asphyxia may occur with the airway open, partially occluded, or closed. Although SIDS autopsies often demonstrate no pathologic findings, most infants who die of SIDS have an extremely large number of petechiae. Their presence suggests that repeated episodes of asphyxia occurred in a period of hours to days before death, causing recurrent gasping episodes with associated petechiae formation. Studies in newborn animals have shown that metabolic recovery from asphyxia takes hours. Thus, repeated asphyxia episodes that were previously self-limited by arousal and autoresuscitation might eventually prove fatal. Whereas short central apnea (< 15 sec) can be normal at all ages, prolonged apnea that disrupts physiologic function is never normal. Some pathologic evidence and ample theoretical evidence support central apnea as a cause of SIDS and obstructive apnea as playing an associated, if not key, role in some infants. Expiratory apnea (lung collapse) also has been proposed as a cause of SIDS; however, necropathologic evidence of its presence is found in only a small minority of cases. Hypoxemia of sufficient severity to produce electroencephalographic (EEG) evidence of cerebral hypoxia does not begin until 60-70 seconds after the onset of obstruction. Although infants placed in the prone position on a level sleeping surface may turn their faces to maintain oxygen flow, respiratory obstruction with compression of the nose and backward displacement of the mobile mandible has been implicated as a cause of asphyxia in the prone position. Gastroesophageal reflux (GER) may play a role in obstructive apnea as well. Regurgitation increases mucosal adhesive forces, a development of particular significance with the more pliable airways of infants. The occurrence of this phenomenon in infants who have laryngeal inflammation secondary to chronic regurgitation increases the risk of obstructive apnea. Unlike older children and adults, normal neonates and infants may exhibit a reflexlike apneic response to a number of physiologic and pathophysiologic conditions, such as hypoxia, hypoglycemia, intracranial bleeding, infection, some toxins, and stimulation of the upper larynx. Studies of the cry characteristics of SIDS siblings demonstrate hyperadductional vibratory behavior of the vocal fold. The acid regurgitated in GER may affect a putative laryngochemoreceptor, causing respiratory pause, airway closure, and swallowing. This may result in an awake apneic event, which is not uncommonly reported by parents. Such apneic responses are probably due to incomplete development of the CNS, increased vagal tone, and decreased respiratory muscle reserve. Although no statistical association has been established between such episodes of apnea and SIDS, the potential for the immature nervous system to interrupt its respiratory cycle easily may be a critical precondition for SIDS shared by all normal infants. Infants with subclinical dysfunction of the autonomic nervous system or those undergoing physiologic stress may be predisposed to fatal evolution of an otherwise benign episode of apnea. Hypoxia, hypercarbia, and other noxious stimuli normally cause arousal and generalized alertness of the musculoskeletal and nervous systems, in addition to tachypnea and gasping. This development is followed by cycles of apnea alternating with a gasp. SIDS is rare during the first month of life, perhaps in part because neonates have better aerobic capacity than older infants and a gasp may raise their PaO2 to over 20 mm Hg and allow them to continue breathing. If such is not the case, each gasp becomes weaker than the preceding one, until terminal apnea and death occur. Indirect evidence suggests that slowly progressive hypoxia inhibits protective ventilatory reflexes in normal infants. When these infants are acutely rechallenged, hypoventilation and apnea result, rather than a tachypneic response. Acquired ventilatory dysfunction may explain the chronic tissue hypoxia seen in many infants who die of SIDS. Several, but not all, studies suggest that at-risk infants have subclinical ventilatory impairment that is midway between normal infants and those with central hypoventilation syndrome. Infants who demonstrate diminished ventilatory response to hypoxia and hypercapnia have significantly diminished arousal response. Such diminished arousal response is correlated with future episodes of apnea that require resuscitation. Death may result during abnormal sleep, from dysfunction of the brainstem, or during normal sleep, when a pathophysiologic setting incites a lethal cascade of events. Diminished arousal response has been identified in newborns who subsequently suffer a BRUE, as well as in asymptomatic siblings of infants who died of SIDS, which suggests that some cases are congenital. Such diminished arousal also may be seen in some healthy infants (who do not have impaired ventilation). Prone sleeping results in hypoxemia and hypercarbia, findings that attach special significance to these abnormal responses to subclinical hypoxemia and hypercarbia and their possible relation to SIDS. Infants at risk have a relative inability to awaken and remain awake from all stages of sleep. Term infants have more episodes of nonperiodic apnea during rapid-eye-movement (REM) sleep, which is autonomically active, than during quiet sleep. Relaxation of respiratory and accessory muscles has been documented in conjunction with skeletal muscle relaxation during REM sleep. Infants who subsequently died of SIDS had significantly more REM-associated obstructive breathing events; however, sleep-related airway obstruction did not occur in high-risk infants as long as there was arousal. Increased respiratory effort, occasionally with transient obstructive apnea, has been noted during quiet, non-REM sleep. Developmental disability of infantile neurorespiratory control is posited, occurring during the transition period when protective subcortical reflexes are no longer present and voluntary defensive responses mediated via the cortex (ie, those that allow reestablishment of ventilation when it has been compromised) have not yet been sufficiently learned. This hypothesis proposes that infants so affected manifest global passivity from ill-defined constitutional, arousal, or behavioral disabilities. Those infants, in turn, have less opportunity to respond, learn, and benefit from experience, including early exposure to normal (partial or brief) airway obstructions. This theory proposes that apnea and bradycardia are the result of primary autonomic dysfunction or sympathetic imbalance. Numerous structural and functional nerve cell abnormalities have been described in infants with SIDS. Evidence suggesting delayed development of the brain stem has been demonstrated in 2 studies in which elevated dendritic spine counts were noted among infants who have died of SIDS. [31, 32] Reductions in the degree of myelination of specific brain regions of infants with SIDS provide further evidence of defective neuronal development. The receptor deficiencies were found to be concentrated in nuclei that control cardiorespiratory response to a variety of stimuli. These receptor deficiencies were noted much more frequently in SIDS victims than in babies dying of other causes. For example, 60-70% of SIDS babies had serotonin receptor defects. It is unlikely that any single defect is solely responsible for SIDS. Ten cardiac channelopathy susceptibility genes are implicated in SIDS. At least 1 in 5 SIDS victims carries a mutation in a cardiac ion channel–related gene, of which the majority are a malignant phenotype. It has been postulated that latent functional defects may only become malignant in the presence of certain conditions, such as acidosis or high temperature. For example, several immunologic polymorphisms that facilitate uncontrolled inflammatory responses are more frequently found in SIDS victims versus controls. One hypothesis is that pathogenic toxins may give rise to an overwhelming proinflammatory cytokine response that then causes the altered physiology resulting in death. Altered cytokine response has also been suggested as a pathophysiologic mechanism by which cigarette smoke can contribute to SIDS. Mutations in genes responsible for encoding the cardiac potassium channels can cause LQTS or SQTS, either of which may result in increased risk for ventricular arrhythmias and sudden cardiac death. Such genetic mutations are found in 5-10% of SIDS cases. In addition to LQTS, other heritable cardiac arrhythmia syndromes (eg, Brugada syndrome and catecholaminergic polymorphic ventricular tachycardia) account for 10-15% of SIDS cases. Most SIDS-related mutations occur in the cardiac sodium channel. The polymorphism S1103Y-SCN5A is associated with increased susceptibility to ventricular arrhythmia and has a prevalence of 13% among African Americans (who have the second highest rate of SIDS in the US). Infants homozygous for Y1103 were found to have a 24-fold increased risk of SIDS. The sodium proton exchanger subtype 3 system (NHE3) plays a role in controlling breathing. Animal studies showed that alveolar ventilation during wakefulness is inversely correlated with expression of NHE3 mRNA in the brainstem; thus, NHE3 expression seems to be related to the set point of normal breathing. This set point is one of the keys to the stability of respiration during sleep. A study of the brainstems of infants who died of SIDS revealed elevated NHE3 expression, suggesting that this might be a causative factor in SIDS. In approximately 40% of infants, flow in one vertebral artery is less than half that in the contralateral vessel; thus, if the larger vessel is occluded, the brainstem is jeopardized much more than it would be if flow were bilaterally equal. If both vertebral arteries are compressed, flow continues, given normal anatomy, via the posterior communicating arteries of the internal carotids. However, flow through the posterior communicating arteries in infants is only 13% of basilar artery flow, and the brainstem is thereby placed at risk. The peak incidence of SIDS is during the second to fourth months of life. Around the third month, a decrease is seen in the passive immunity conferred by the mother, as the infant’s immune system is activated. Early active immunity triggers localized immunologic responses to several substances, including respiratory irritants and infectious agents, with the potential for bronchospasm, pulmonary edema, and cytokine-mediated effects (eg, fever). Raised concentrations of immunoglobulin G (IgG), immunoglobulin M (IgM), and immunoglobulin A (IgA) have been recovered from infants who died of SIDS but not from infants who died from explained causes. The peak incidence of SIDS coincides with critical periods in the development of the immune system; at such a time, the infant might be transiently vulnerable to lethal infection. SIDS incidence increases in the winter, during viral epidemics in a community, and 2 weeks after viral infection. Compared with healthy control infants and infants who died of known causes, infants who died of SIDS are more likely to harbor toxigenic bacteria, such as Escherichia coli, Staphylococcus aureus, and Clostridium difficile, as well as influenza virus and respiratory syncytial virus (RSV). Most strongly implicated is RSV, which is well known for its association with central apnea. Approximately 70% of infants with SIDS have a history of recent mild upper respiratory or gastrointestinal (GI) tract illness in the days preceding death. Severe fatty change in the liver is noted at autopsy in a small proportion of SUID cases. Such change may be observed in various conditions, including severe dehydration associated with an enterocolitis, systemic sepsis, or inherited metabolic disorders. Previously, as many as 10% of SIDS deaths were thought to be due to definable inherited metabolic diseases. In the fed state, glucose is the primary substrate for energy metabolism. In the fasted state, fat replaces glucose as a source of fuel. Long-chain fatty acids are mobilized from adipose tissue and are metabolized within the mitochondrion by progressive beta-oxidation. The first steps in the processing of fats are facilitated by acyl-CoA dehydrogenases. Three distinct acyl-CoA dehydrogenases have been identified, with varying affinities for long-, medium-, and short-chain fatty acids. Inherited defects of all 3 dehydrogenases are now recognized. The most common disorder of fatty acid beta-oxidation is medium-chain acyl-CoA dehydrogenase deficiency (MCADD). MCADD is an autosomal recessive disorder. Studies of its molecular basis have demonstrated that in approximately 90% of those affected, the condition is caused by a single point mutation (G-985). Use of polymerase chain reaction (PCR) techniques to determine the frequency of the G-985 mutation in SIDS and control populations has failed to demonstrate the homozygous condition in SIDS. Affected children typically present within the first 2 years of life with altered mental status and hypoglycemia brought on by periods of reduced nutritional intake associated with acute viral respiratory or GI illnesses. Previously, as many as 25% of children affected with MCADD were estimated to have presented with sudden unexpected death. Defects in fatty acid beta-oxidation should be considered in instances of sudden death associated with fatty change of the liver on autopsy or in situations of SIDS with atypical features (eg, early neonatal death, death in children older than 1 year, or a history of SIDS within a family). It has been proposed that SIDS results from a developmental malfunction of brainstem centers that control respiratory or cardiac functions during sleep. This malfunction occurs as the body’s thermostats change from fetal to mature mode, usually during the second to third months of life. At some point, in healthy infants aged 8-16 weeks, 2 sleep-related temperature patterns emerge: a precipitous drop in rectal temperature amounting to several tenths of a degree Celsius, followed by hourly oscillations throughout sleep. These temperature fluctuations are thought to herald maturation of the brainstem during months 2-4 of life (which is also the peak period for the occurrence of SIDS). As the baby grows, heightened metabolism and increasing body fat prompt a shift from the neonate’s susceptibility to cold stress to the infant’s increased vulnerability to heat stress. The shift occurs at about the same time as the highest risk for SIDS. This hyperthermic response may be aggravated by the increased metabolism seen during the early stages of a viral infection, as well as via IL-mediated vasoconstriction. Thus, even small elevations in body temperature can profoundly affect the respiratory rate, resulting in hypoventilation and apnea. Vulnerable periods in brainstem maturation may be critical when associated with the prone sleeping position. In this position, infants often sleep with the face down, especially in response to cold stimulus to the face. A study of infants aged 3-37 weeks who never slept on their stomachs found that the infants did not learn the behaviors that could reduce their risk of SIDS if they were prone. When the researchers placed a comforter over a foam rubber mattress directly under the babies’ faces, all babies awoke after about 5 minutes and sought fresher air. Those experienced in sleeping prone lifted and turned their heads to the side; however, those inexperienced in sleeping prone only nuzzled the bedding or briefly lifted their heads and then resumed sleeping face down. An infant sleeping prone, surrounded by a soft mattress, blankets, or other bedding—and possibly sleeping in the same bed with adults and compressed by or between large bodies—is in an environment that predisposes to progressive increase in carbon dioxide-rich, oxygen-poor air. The normal responses to rebreathing expired air are increased ventilation and arousal. Repetitive exposure to hypoxia causes a blunting of arousal and autonomic response  ; with normal responses blunted, hypoxia and hypercarbia may proceed unchecked. A study using the cadavers of infants aged 6-9 weeks who were found dead in their cribs measured resistance to airflow pumped through the upper respiratory tract. When the body was placed face down on a pillow on various types of bedding, respiratory resistance increased 30- to 40-fold. Moisture of respiration, regurgitated milk, and mucus from the nostrils may dampen bedding material, increasing the obstructive effect when this material is compressed against the mouth and nose. When the pillow was damp, mean pressure increased by 235%. Thermal stress and rebreathing of carbon dioxide may be interrelated as contributors to SIDS. Hyperpnea secondary to rebreathing increases the production of heat; rebreathing of warmed, expired air reduces respiratory heat exchange and enhances thermal stress; heat stress is presumably associated with an increased production of carbon dioxide, which could increase the risk of suffocation. Sleeping in a hyperthermic environment also may alter the response to hypoxia or hypercarbia. An inadequate response to a critical incident may precipitate SIDS in a vulnerable infant who has acquired deficits in arousal or other physiologic aberrations in utero that are enhanced during postnatal development. The dangers of prone sleeping also may stem from more episodes of quiet sleep, sleep for longer periods with fewer arousals, and decreased ability to lose heat, which is a phenomenon that may be enhanced by a heated room, excessive wrapping, fever, or illness. In view of the relationship between the risk of SIDS and increased temperature, it is reasonable to ask, Why does the incidence of SIDS increase in cold temperature? Evidence suggests that autonomic dysfunction in at-risk infants is greatest at the lowest ambient temperature, even though body temperature remains normal. This cold-induced autonomic dysfunction may explain the association between SIDS and the cold ambient temperatures of winter. An interesting correlation between several of the factors discussed above and the possibility of vertebral artery compression has been suggested. For example, in the prone sleeping position, infants who have the ability to do so will attempt to clear their nose from bedding by extending or rotating their head. These are the exact neck positions potentially productive of vertebral artery compression with resultant brainstem ischemia. During the first months of life, the infant brainstem is particularly vulnerable to ischemia as a result of blood flow lagging behind the rapidly growing brainstem. SIDS is not common before the age of 1 month or after the age of 6 months. In the first month of life, infants may lack both the strength and the coordination to rotate or extend their heads to the degree required for compression of the vertebral artery. By age 6 months, however, the adverse anatomy that may predispose to arterial compression has begun to resolve. The vertebral arteries arise from the subclavian arteries; thus, the vertebrobasilar circulation is in competition with the vascular beds of the upper extremities for flow. Heating of the limbs has the potential to increase blood flow to the upper extremities by 4-5 times the norm, thus potentially diverting blood flow that would otherwise go to the vertebral arteries and necessitating vasodilation of the vertebrobasilar system to maintain constant flow to the posterior fossa. Passive smoking has been found to impair vasodilatation in young adults. Should a similar mechanism be operative in infants, the vertebral arteries may lack the ability to dilate adequately to prevent subclavian steal resulting from overheating. Most cases of SIDS probably result from a lethal sequence of events initiated by a temporary defect in neural control of either respiratory or cardiac function during vulnerable periods in the maturation of respiratory control, sleep-wake development, and thermoregulation. Cardiorespiratory function, arousal and gasp reflexes, autonomic mechanisms, chemoreceptor sensitivity, thermoregulation, and sleep control are all controlled by the medullary and related structures of the brainstem. Autopsy examinations of the brainstems of infants with a diagnosis of SIDS have demonstrated hypoplasia or decreased neurotransmitter binding of the arcuate nucleus, the region of the brain believed to be involved with hypercapnic ventilatory response, chemosensitivity, and blood pressure responses. The exact nature of the possible brainstem dysfunction is unknown. One hypothesis involves exaggeration of the postulated developmental lag between loss of infantile protective neuroreflexes and development of mature integrative connections in the brainstem. Another proposes that brainstem dysfunction may be congenital or may be the result of arrested maturation of the otherwise normal brain by an internal or external agent. If this hypothesis is true, SIDS is an acquired, and therefore potentially preventable, cause of death. Yet another hypothesis is that SIDS is the result of a transient physiologically vulnerable period during maturation of a normal CNS, in which the coincidence of several risk factors may cause apnea and death. This theory can incorporate other proposed SIDS mechanisms, such as abnormal infantile respiratory patterns leading to apnea, exaggerated vagal response to GER, sleep disorders, and autonomic dysfunction. It also can account for the variable epidemiologic and pathophysiologic findings and the frequent lack of demonstrable pathology at autopsy. Infants at increased risk for SIDS include term infants who have had a BRUE, premature infants of low birth weight, infants of substance-abusing mothers, and infants with apnea of infancy. Perinatal and sociodemographic risk factors were not independently associated with SIDS. Of the risk factors examined, only maternal smoking during pregnancy was independently associated with SIDS. Despite extensive workup, no definitive cause can be found for more than 50% of BRUEs. In the general population, 1-3% of infants experience a BRUE. Of all infants who die of SIDS, 5-7% have a history of BRUE. A large study that reviewed all types of BRUEs found a 1% risk of subsequent SIDS. These data should be interpreted within the context that most studies of BRUEs and SIDS have excluded infants with a history of prematurity, chronic lung disease, or congenital heart disease. Strong data associate “serious” BRUEs (those that were experienced during sleep or necessitated vigorous stimulation or CPR) and SIDS. Infants with such a BRUE have an 8-10% risk of SIDS. Infants with a history of more than 1 serious BRUE have a 28% risk of SIDS despite use of home monitoring. Among the causes of BRUEs are infection (5-40%, depending on the season), laryngeal chemoreceptor stimulation secondary to GER (20%), and seizures and other neurologic disorders (15-20%). Cardiac dysrhythmias and abuse (including Munchausen syndrome by proxy) should also be included in the differential diagnosis. Cyanotic congenital heart disease generally presents in the first few weeks of life, with difficulty in feeding, poor weight gain, and diaphoresis. Anecdotal, pathologic, physiologic, and epidemiologic data suggest that apnea of infancy is a risk factor for SIDS, though there is no conclusive evidence. Patients with apnea of infancy have a mortality in the range of 2-6%. The rate climbs to 10% for infants who manifest apnea during sleep on 1-2 occasions; the risk of death triples if there are more than 2 incidents. Only 2-4% of infants who die of SIDS have a record of apnea of prematurity. At the time of death, 30-50% of otherwise healthy infants have an acute infection, such as gastroenteritis, otitis media, or, in particular, upper respiratory tract infection (URTI). Infantile botulism may be the cause of 5-10% of sudden infant deaths. Of particular note, RSV is associated with life-threatening apneic episodes, particularly in premature infants and those with a history of apnea. During RSV season, the virus reported causes as many as 40% of BRUEs. In older male infants, there appears to be an association between infection and SIDS. Approximately 65% of SIDS deaths occur in autumn and winter, and infection may play a role in these deaths. Lazoff and Kauffman maintain that SIDS is not associated with changes in core body temperature; this view is not universal. The incidence of SIDS increases with colder outdoor temperature and warmer indoor (room) temperature. Increased apoptosis in the brainstem of SIDS infants has been found to be affected by postconceptional age, male gender, prone sleep position, and exposure to cigarette smoke. The increased cell death in the dorsal column nuclei could result in dampening or loss in relay of touch and proprioception, creating difficulty when an infant in the prone position attempts to turn into the supine position. A study from New Zealand suggests that infants who are not breastfed are at increased risk for SIDS. Other studies, conducted in countries with a low incidence of SIDS, have failed to demonstrate a similar correlation. In 3 studies, a link was found between SIDS and maternal psychiatric disorders. ; 2 of them reported a link between SIDS and postnatal depression, and 1 identified a link between a history of depression in the year before birth and a (statistically nonsignificant) trend toward an association between SIDS and depression after birth. Cigarette smoking during pregnancy is highly significant as a risk factor in the pathogenesis of SIDS. In the 1980s, the smoking rate among SIDS mothers was reported to be 70%, whereas it decreased to 42% in the 1990s. The incidence of SIDS is 7 times higher among infants whose mothers smoked more than 1 pack per day during pregnancy. A risk factor independent of prenatal exposure to tobacco is the chronic exposure to cigarette smoke that infants experience when parents smoke. Infants so exposed demonstrate a modest increase in SIDS. Data indicate that if women refrained from smoking (a completely modifiable risk factor) during pregnancy, as many as 30-46.7% of SIDS deaths might be prevented. Abuse of drugs other than nicotine is less strongly associated with SIDS. Prenatal exposure to cocaine may cause cocaine-induced maturational delay. Term newborns exposed to cocaine prenatally have respiratory instability similar to that seen in preterm infants not exposed to cocaine. The risk posed by heroin—or, in particular, the synthetic narcotic methadone—is higher than that conferred by cocaine. Caffeine can cross the placental barrier and reach the fetus, an effect potentiated in the third trimester, when caffeine elimination from the mother is reduced about 3-fold. Ford et al first reported an association between caffeine intake in pregnancy and SIDS,  documenting heavy caffeine consumption throughout pregnancy in 14% of control mothers and in 28% of mothers whose infants died from SIDS. Some studies have found an association between caffeine intake and low birth weight and spontaneous abortion. Withdrawal from caffeine at birth can induce apnea in newborns. Even though caffeine has a respiratory stimulant effect, maternal caffeine use during pregnancy has been associated with central apnea in infants. This raises the possibility that the fetal respiratory center may be altered in the presence of high caffeine concentrations, only to be left with an inadequate respiratory drive when exposed to stressors in the absence of caffeine. The pathophysiologic mechanism may involve adenosine receptor sites in the brainstem. Long-term caffeine exposure causes an increase in the number of adenosine receptors, with caffeine serving as a competitive antagonist. Adenosine, which can induce respiratory depression in newborn animals, is produced during episodes of severe hypoxia. Prior in utero exposure to caffeine may increase the vulnerability of an infant who is exposed to episodes of hypoxia after birth. After adjustments are made for confounding variables (eg, maternal smoking), the relative risk of SIDS for infants born to mothers with heavy caffeine use (defined as consumption of more than 400 mg/day, as in 4 cups of coffee or 10 cups of tea or glasses of cola) is 1.30 for the first trimester, 1.46 for the third trimester, and 1.65 for heavy caffeine use throughout pregnancy. Gausche further states that siblings of an infant who dies of SIDS are not at increased risk for SIDS. Reece supports this view and reports that when families matched for maternal age and birth rank are compared, there is no statistically significant difference in SIDS rate or total infant mortality between families with a history of SIDS and those without such a history. Other authors, however, indicate that siblings of infants who have succumbed to SIDS are in fact at higher risk. Many of the epidemiologic risk factors for SIDS and other causes of infant mortality are identical. Oyen et al reported that the combined effect of nonsupine sleeping and other prenatal and maternal risk factors carried very high SIDS risks. The combination of prone sleeping and birth weight lower than 2500 g was far greater than the sum of the risk from each risk factor alone. In infants aged 13-24 weeks, the combined effect of nonsupine sleeping and lower birth weight carried the highest risk for SIDS. A study by Ackerman et al examined 15 fatalities in which infants aged 3 months or younger were placed face down in a level, suspended rocking cradle. In 14 of the cases, a locking pin to prevent cradle movement was not used. Whether because the cradle was set in motion, or because infants shifted to one end of the cradle during normal sleep movements, Infants were typically found lying in the dependent end, with the head pressed against the mesh, a position that makes it harder to move or turn the head. Although the rocking cradles involved in these deaths have been removed from the US market, those already sold may still be passed on from one baby to another or bought secondhand. Such cradles constitute a potentially lethal sleeping environment unless the locking mechanism is used. Sleeping in the same bed with a parent and sleeping on a soft surface or polystyrene-filled cushion also have been implicated as risk factors for SIDS. Overall, 2 of every 3 infants are in nonparental child care for varying periods of time. About 50% are cared for by relatives, 10% are cared for by an in-home baby sitter, and 40% are in some other form of organized child care. The circumstances surrounding mistreatment of a child may range from a sudden isolated loss of control by a parent, to long-standing premeditated acts intended to harm the child. Multiple personal, familial, and environmental pressures may accumulate to push parents or other caregivers beyond the thresholds of restraint. Consequently, there is a need for a thorough and competent death investigation that must include an evaluation of the infant and family medical history and review of the scene of death to distinguish natural from nonnatural infant deaths. In a landmark study, Southall et al used covert video recordings to study 39 infants (median age, 9 months; range, 2-44 months), most of whom were referred for evaluation of a BRUE. Of the 39 suspected cases, 33 involved abuse. Intentional suffocation was documented in 30 cases, with poisonings, deliberate fracture, and other emotional and physical abuse identified in the remainder. The first BRUE occurred at a median age of 3.6 months (corrected for expected date of delivery). Of the 41 siblings of the suspect patients, 12 died, with 11 of the deaths attributed to SIDS. When parents were confronted with video surveillance evidence, 4 of them admitted to the deliberate suffocation of 8 of the children. In comparison, of the 52 siblings of the 46 control subjects, 2 died, with SIDS listed as the cause of 1 death. The high number of deaths in siblings is evidence of the long-term risk posed to children in severely dysfunctional families. In spring 1992, a multiagency statement directed by officials at the National Institutes of Child Health and Human Development (NICHD) was issued, informing health care providers and the general public that a supine sleep position could significantly reduce SIDS. In spring 1994, this was followed by the federal “Back to Sleep” campaign (see the image below),  sponsored by the NICHD, the American Academy of Pediatrics (AAP), the Association of SIDS and Infant Mortality Programs (ASIP), the SIDS Alliance, and the United States Public Health Service. Adapted from American Academy of Pediatrics Task Force on Sudden Infant Death Syndrome. The changing concept of sudden infant death syndrome: diagnostic coding shifts, controversies regarding the sleeping environment, and new variables to consider in reducing risk. Pediatrics. Nov 2005;116(5):1245-55. After the “Back to Sleep” campaign, federal SIDS researchers carried out annual surveys to examine how infant sleep practices and SIDS rates have changed. These studies, conducted by NICHD, demonstrated that the rate of prone sleeping for infants decreased from approximately 75% in 1992 to a low of 11.3% in 2002. The observation that the rate of prone sleeping increased to 14.5% in 2008 is of some concern. 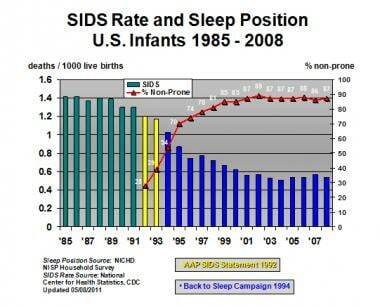 Since 1992, SIDS rates have fallen by approximately 58% in the United States (see the image below). In 1992, the incidence of SIDS was 1.2 cases per 1000 live births; in 2004, the incidence had dropped to 0.51. In 2004, 2246 deaths were certified as SIDS, accounting for 8% of infant deaths. In 2006, the National Center for Health Statistics reported a total of 2323 SIDS deaths nationwide, for an incidence of 0.54 per 1000 live births. Although cases of true SIDS are decreasing, concern exists that the proportion of unexplained infant deaths resulting from child abuse may be increasing. Notably, the AAP estimates that the incidence of infanticide among cases designated as SIDS ranges from less than 1% to 5%. With a change to supine sleep for infants, cigarette smoke exposure has emerged as one of the most important potentially modifiable risk factors for SIDS. Infants of mothers who smoke have a 2-fold to 5-fold higher risk of SIDS,  and postnatal smoking by one or both parents has been identified as an independent SIDS risk factor. Despite emphasis within “Back to Sleep” campaigns on avoidance of cigarette smoke exposure (prenatal and postnatal), rates of maternal smoking during pregnancy have changed little in most countries. After "Back to Sleep" initiatives in Germany, Vennemann et al reexamined SIDS risk factors and noted that although only 4.1% of infants slept prone, those infants were at high risk for SIDS. Infants unaccustomed to sleeping prone were at very high risk, as were those who turned to prone. Bed-sharing, duvets, sleeping prone on a sheepskin, sleeping in the house of a friend or a relative, and sleeping in the living room increased the risk of SIDS. Pacifier use during sleep continued to be associated with a significantly reduced risk of SIDS. Approximately 60-70% of SIDS deaths occur in males. Despite other notable changes in SIDS epidemiology, the male-to-female ratio has remained relatively unchanged in most population studies. These variations remain unexplained but appear to be independent of other risk factors, such as low birth weight, young maternal age, or high parity. They appear to mirror those observed for infant mortality in general. Physicians should use appropriate opportunities to provide education to parents about the prevention of SIDS, including the supine sleep position, prevention of overheating, and nonsmoking. Knowledge of various theories concerning the etiology of SIDS, as well as the limitations of current understanding, is useful in parental discussions concerning BRUEs and SIDS. When an infant has died, it is helpful to provide parents with information about SIDS and the telephone number of a local SIDS support group (if one exists). For patient education resources, see the Children’s Health Center and the Mental Health Center, as well as Sudden Infant Death Syndrome (SIDS), Bruises, and Grief and Bereavement. Sudden Unexpected Infant Death and Sudden Infant Death Syndrome. Centers for Disease Control and Prevention. Available at http://www.cdc.gov/sids/aboutsuidandsids.htm. Accessed: November 13, 2014. Krous HF, Beckwith JB, Byard RW, Rognum TO, Bajanowski T, Corey T, et al. Sudden infant death syndrome and unclassified sudden infant deaths: a definitional and diagnostic approach. Pediatrics. 2004 Jul. 114(1):234-8. [Medline]. Audero E, Gross C. Could serotonin play a role in sudden infant death?. Pediatr Res. 2009 Feb. 65(2):131. [Medline]. Kinney HC, Randall LL, Sleeper LA, Willinger M, Belliveau RA, Zec N, et al. Serotonergic brainstem abnormalities in Northern Plains Indians with the sudden infant death syndrome. J Neuropathol Exp Neurol. 2003 Nov. 62(11):1178-91. [Medline]. Paterson DS, Trachtenberg FL, Thompson EG, Belliveau RA, Beggs AH, Darnall R, et al. Multiple serotonergic brainstem abnormalities in sudden infant death syndrome. JAMA. 2006 Nov 1. 296(17):2124-32. [Medline]. Duncan JR, Paterson DS, Hoffman JM, Mokler DJ, Borenstein NS, Belliveau RA, et al. Brainstem serotonergic deficiency in sudden infant death syndrome. JAMA. 2010 Feb 3. 303(5):430-7. [Medline]. [Full Text]. Krous HF, Haas EA, Masoumi H, Chadwick AE, Stanley C. A comparison of pulmonary intra-alveolar hemorrhage in cases of sudden infant death due to SIDS in a safe sleep environment or to suffocation. Forensic Sci Int. 2007 Oct 2. 172(1):56-62. [Medline]. Ostfeld BM, Esposito L, Perl H, Hegyi T. Concurrent risks in sudden infant death syndrome. Pediatrics. 2010 Mar. 125(3):447-53. [Medline]. Brixey SN, Kopp BC, Schlotthauer AE, Collier A, Corden TE. Use of child death review to inform sudden unexplained infant deaths occurring in a large urban setting. Inj Prev. 2011 Feb. 17 Suppl 1:i23-7. [Medline]. Krous HF. Sudden Unexpected death in infancy and the dilemma of defining the sudden infant death syndrome. Current Pediatric Reviews. 2010. 6;(1):5-12. Leiter JC, Böhm I. Mechanisms of pathogenesis in the Sudden Infant Death Syndrome. Respir Physiol Neurobiol. 2007 Nov 15. 159(2):127-38. [Medline]. Kinney HC. Brainstem mechanisms underlying the sudden infant death syndrome: evidence from human pathologic studies. Dev Psychobiol. 2009 Apr. 51(3):223-33. [Medline]. Kinney HC. Neuropathology provides new insight in the pathogenesis of the sudden infant death syndrome. Acta Neuropathol. 2009 Mar. 117(3):247-55. [Medline]. Filiano JJ, Kinney HC. A perspective on neuropathologic findings in victims of the sudden infant death syndrome: the triple-risk model. Biol Neonate. 1994. 65(3-4):194-7. [Medline]. Trachtenberg FL, Haas EA, Kinney HC, Stanley C, Krous HF. Risk factor changes for sudden infant death syndrome after initiation of Back-to-Sleep campaign. Pediatrics. 2012 Apr. 129(4):630-8. [Medline]. [Full Text]. Van Norstrand DW, Ackerman MJ. Genomic risk factors in sudden infant death syndrome. Genome Med. 2010 Nov 30. 2(11):86. [Medline]. [Full Text]. Rhodes TE, Abraham RL, Welch RC, Vanoye CG, Crotti L, Arnestad M, et al. Cardiac potassium channel dysfunction in sudden infant death syndrome. J Mol Cell Cardiol. 2008 Mar. 44(3):571-81. [Medline]. [Full Text]. Ackerman MJ, Siu BL, Sturner WQ, Tester DJ, Valdivia CR, Makielski JC, et al. Postmortem molecular analysis of SCN5A defects in sudden infant death syndrome. JAMA. 2001 Nov 14. 286(18):2264-9. [Medline]. Arnestad M, Crotti L, Rognum TO, Insolia R, Pedrazzini M, Ferrandi C, et al. Prevalence of long-QT syndrome gene variants in sudden infant death syndrome. Circulation. 2007 Jan 23. 115(3):361-7. [Medline]. Otagiri T, Kijima K, Osawa M, Ishii K, Makita N, Matoba R, et al. Cardiac ion channel gene mutations in sudden infant death syndrome. Pediatr Res. 2008 Nov. 64(5):482-7. [Medline]. Millat G, Kugener B, Chevalier P, Chahine M, Huang H, Malicier D, et al. Contribution of long-QT syndrome genetic variants in sudden infant death syndrome. Pediatr Cardiol. 2009 May. 30(4):502-9. [Medline]. Klaver EC, Versluijs GM, Wilders R. Cardiac ion channel mutations in the sudden infant death syndrome. Int J Cardiol. 2011 Oct 20. 152(2):162-70. [Medline]. Schwartz PJ, Stramba-Badiale M, Segantini A, Austoni P, Bosi G, Giorgetti R, et al. Prolongation of the QT interval and the sudden infant death syndrome. N Engl J Med. 1998 Jun 11. 338(24):1709-14. [Medline]. Meny RG, Carroll JL, Carbone MT, Kelly DH. Cardiorespiratory recordings from infants dying suddenly and unexpectedly at home. Pediatrics. 1994 Jan. 93(1):44-9. [Medline]. Marom T, Cinamon U, Castellanos PF, Cohen MC. Otolaryngological aspects of sudden infant death syndrome. Int J Pediatr Otorhinolaryngol. 2012 Mar. 76(3):311-8. [Medline]. Robb MP, Crowell DH, Dunn-Rankin P, Tinsley C. Cry features in siblings of SIDS. Acta Paediatr. 2007 Oct. 96(10):1404-8. [Medline]. Siren PM, Siren MJ. Critical diaphragm failure in sudden infant death syndrome. Ups J Med Sci. 2011 May. 116(2):115-23. [Medline]. [Full Text]. Männikkö R, Wong L, Tester DJ, et al. Dysfunction of NaV1.4, a skeletal muscle voltage-gated sodium channel, in sudden infant death syndrome: a case-control study. The Lancet. March 28, 2018. Kinney HC, Brody BA, Finkelstein DM, Vawter GF, Mandell F, Gilles FH. Delayed central nervous system myelination in the sudden infant death syndrome. J Neuropathol Exp Neurol. 1991 Jan. 50(1):29-48. [Medline]. Takashima S, Becker LE. Delayed dendritic development of catecholaminergic neurons in the ventrolateral medulla of children who died of sudden infant death syndrome. Neuropediatrics. 1991 May. 22(2):97-9. [Medline]. Ozawa Y, Takashima S. Developmental neurotransmitter pathology in the brainstem of sudden infant death syndrome: a review and sleep position. Forensic Sci Int. 2002 Sep 14. 130 Suppl:S53-9. [Medline]. Adamopoulos C, Greney H, Beutelstetter M, Bousquet P, Livolsi A. Expression of Circulating Muscarinic Receptors in Infants With Severe Idiopathic Life-Threatening Events. JAMA Pediatr. 2016 May 9. [Medline]. Rand CM, Berry-Kravis EM, Zhou L, Fan W, Weese-Mayer DE. Sudden infant death syndrome: rare mutation in the serotonin system FEV gene. Pediatr Res. 2007 Aug. 62(2):180-2. [Medline]. Kinney HC. Abnormalities of the brainstem serotonergic system in the sudden infant death syndrome: a review. Pediatr Dev Pathol. 2005 Sep-Oct. 8(5):507-24. [Medline]. Kinney HC, Filiano JJ, Harper RM. The neuropathology of the sudden infant death syndrome. A review. J Neuropathol Exp Neurol. 1992 Mar. 51(2):115-26. [Medline]. Audero E, Coppi E, Mlinar B, Rossetti T, Caprioli A, Banchaabouchi MA, et al. Sporadic autonomic dysregulation and death associated with excessive serotonin autoinhibition. Science. 2008 Jul 4. 321(5885):130-3. [Medline]. Nattie E. Sudden infant death syndrome and serotonin: animal models. Bioessays. 2009 Feb. 31(2):130-3. [Medline]. Dergacheva O, Kamendi H, Wang X, Pinol RM, Frank J, Jameson H, et al. The role of 5-HT3 and other excitatory receptors in central cardiorespiratory responses to hypoxia: implications for sudden infant death syndrome. Pediatr Res. 2009 Jun. 65(6):625-30. [Medline]. [Full Text]. Willinger M. Sudden Infant Death Syndrome: a challenge. J NIH Res. 1989. 1:73-80. Willinger M, Ko CW, Hoffman HJ, Kessler RC, Corwin MJ. Factors associated with caregivers' choice of infant sleep position, 1994-1998: the National Infant Sleep Position Study. JAMA. 2000 Apr 26. 283(16):2135-42. [Medline]. Zareba W, Moss AJ, Schwartz PJ, Vincent GM, Robinson JL, Priori SG, et al. Influence of genotype on the clinical course of the long-QT syndrome. International Long-QT Syndrome Registry Research Group. N Engl J Med. 1998 Oct 1. 339(14):960-5. [Medline]. Rubens DD, Vohr BR, Tucker R, O'Neil CA, Chung W. Newborn oto-acoustic emission hearing screening tests: preliminary evidence for a marker of susceptibility to SIDS. Early Hum Dev. 2008 Apr. 84(4):225-9. [Medline]. Weese-Mayer DE, Ackerman MJ, Marazita ML, Berry-Kravis EM. Sudden Infant Death Syndrome: review of implicated genetic factors. Am J Med Genet A. 2007 Apr 15. 143A(8):771-88. [Medline]. Opdal SH, Vege A, Rognum TO. Serotonin transporter gene variation in sudden infant death syndrome. Acta Paediatr. 2008 Jul. 97(7):861-5. [Medline]. Tfelt-Hansen J, Winkel BG, Grunnet M, Jespersen T. Cardiac channelopathies and sudden infant death syndrome. Cardiology. 2011. 119(1):21-33. [Medline]. Van Norstrand DW, Tester DJ, Ackerman MJ. Overrepresentation of the proarrhythmic, sudden death predisposing sodium channel polymorphism S1103Y in a population-based cohort of African-American sudden infant death syndrome. Heart Rhythm. 2008 May. 5(5):712-5. [Medline]. Wiemann M, Frede S, Tschentscher F, Kiwull-Schöne H, Kiwull P, Bingmann D, et al. NHE3 in the human brainstem: implication for the pathogenesis of the sudden infant death syndrome (SIDS)?. Adv Exp Med Biol. 2008. 605:508-13. [Medline]. Vege A, Rognum TO, Scott H, Aasen AO, Saugstad OD. SIDS cases have increased levels of interleukin-6 in cerebrospinal fluid. Acta Paediatr. 1995 Feb. 84(2):193-6. [Medline]. Rognum IJ, Haynes RL, Vege A, Yang M, Rognum TO, Kinney HC. Interleukin-6 and the serotonergic system of the medulla oblongata in the sudden infant death syndrome. Acta Neuropathol. 2009 Oct. 118(4):519-30. [Medline]. [Full Text]. Miller ME, Brooks JG, Forbes N, Insel R. Frequency of medium-chain acyl-CoA dehydrogenase deficiency G-985 mutation in sudden infant death syndrome. Pediatr Res. 1992 Apr. 31(4 Pt 1):305-7. [Medline]. Ziadeh R, Hoffman EP, Finegold DN, Hoop RC, Brackett JC, Strauss AW, et al. Medium chain acyl-CoA dehydrogenase deficiency in Pennsylvania: neonatal screening shows high incidence and unexpected mutation frequencies. Pediatr Res. 1995 May. 37(5):675-8. [Medline]. Horvath GA, Davidson AG, Stockler-Ipsiroglu SG, Lillquist YP, Waters PJ, Olpin S, et al. Newborn screening for MCAD deficiency: experience of the first three years in British Columbia, Canada. Can J Public Health. 2008 Jul-Aug. 99(4):276-80. [Medline]. Hsu HW, Zytkovicz TH, Comeau AM, Strauss AW, Marsden D, Shih VE, et al. Spectrum of medium-chain acyl-CoA dehydrogenase deficiency detected by newborn screening. Pediatrics. 2008 May. 121(5):e1108-14. [Medline]. Oyen N, Markestad T, Skaerven R, Irgens LM, Helweg-Larsen K, Alm B, et al. Combined effects of sleeping position and prenatal risk factors in sudden infant death syndrome: the Nordic Epidemiological SIDS Study. Pediatrics. 1997 Oct. 100(4):613-21. [Medline]. Bejjani C, Machaalani R, Waters KA. The dorsal motor nucleus of the vagus (DMNV) in sudden infant death syndrome (SIDS): pathways leading to apoptosis. Respir Physiol Neurobiol. 2013 Jan 15. 185(2):203-10. [Medline]. American Academy of Pediatrics Task Force on Infant Positioning and SIDS. Positioning and sudden infant death syndrome (SIDS): update. American Academy of Pediatrics Task Force on Infant Positioning and SIDS. Pediatrics. 1996 Dec. 98(6 Pt 1):1216-8. [Medline]. Esani N, Hodgman JE, Ehsani N, Hoppenbrouwers T. Apparent life-threatening events and sudden infant death syndrome: comparison of risk factors. J Pediatr. 2008 Mar. 152(3):365-70. [Medline]. Thompson JM, Thach BT, Becroft DM, Mitchell EA. Sudden infant death syndrome: risk factors for infants found face down differ from other SIDS cases. J Pediatr. 2006 Nov. 149(5):630-633. [Medline]. Krous HF, Haas EA, Chadwick AE, Masoumi H, Mhoyan A, Stanley C. Delayed death in sudden infant death syndrome: a San Diego SIDS/SUDC Research Project 15-year population-based report. Forensic Sci Int. 2008 Apr 7. 176(2-3):209-16. [Medline]. Lazoff M, Kauffman F. Sudden infant death syndrome--Part I: General features. Acad Emerg Med. 1995 Oct. 2(10):926-33. [Medline]. Berkowitz CD. Sudden infant death syndrome. Tintinalli JE, ed. Emergency Medicine: A Comprehensive Study Guide. 4th ed. New York: McGraw-Hill; 1996. Gausche M. Sudden infant death syndrome. Rosen, ed. Emergency Medicine: Concepts and Clinical Practice. 4th ed. St. Louis: Mosby; 1998. Machaalani R, Waters KA. Neuronal cell death in the Sudden Infant Death Syndrome brainstem and associations with risk factors. Brain. 2008 Jan. 131:218-28. [Medline]. Howard LM, Kirkwood G, Latinovic R. Sudden infant death syndrome and maternal depression. J Clin Psychiatry. 2007 Aug. 68(8):1279-83. [Medline]. Hoppenbrouwers T, Hodgman JE, Ramanathan A, Dorey F. Extreme and conventional cardiorespiratory events and epidemiologic risk factors for SIDS. J Pediatr. 2008 May. 152(5):636-41. [Medline]. Moon RY, Horne RS, Hauck FR. Sudden infant death syndrome. Lancet. 2007 Nov 3. 370(9598):1578-87. [Medline]. Kahlert C, Rudin C, Kind C. Sudden infant death syndrome in infants born to HIV-infected and opiate-using mothers. Arch Dis Child. 2007 Nov. 92(11):1005-8. [Medline]. [Full Text]. O'Leary CM, Jacoby PJ, Bartu A, D'Antoine H, Bower C. Maternal alcohol use and sudden infant death syndrome and infant mortality excluding SIDS. Pediatrics. 2013 Mar. 131(3):e770-8. [Medline]. Ford RP, Schluter PJ, Mitchell EA, Taylor BJ, Scragg R, Stewart AW. Heavy caffeine intake in pregnancy and sudden infant death syndrome. New Zealand Cot Death Study Group. Arch Dis Child. 1998 Jan. 78(1):9-13. [Medline]. [Full Text]. Reece RM. Fatal child abuse and sudden infant death syndrome: a critical diagnostic decision. Pediatrics. 1993 Feb. 91(2):423-9. [Medline]. Bacon CJ, Hall DB, Stephenson TJ, Campbell MJ. How common is repeat sudden infant death syndrome?. Arch Dis Child. 2008 Apr. 93(4):323-6. [Medline]. Gilbert-Barness EF, Barness LA. Sudden infant death syndrome. Is it a cause of death?. Arch Pathol Lab Med. 1993 Dec. 117(12):1246-8. [Medline]. Ackerman J, Gilbert-Barness E. Suspended rocking cradles, positional asphyxia, and sudden infant death. Arch Pediatr Adolesc Med. 1997 Jun. 151(6):573-5. [Medline]. Pease AS, Fleming PJ, Hauck FR, Moon RY, Horne RS, L'Hoir MP, et al. Swaddling and the Risk of Sudden Infant Death Syndrome: A Meta-analysis. Pediatrics. 2016 Jun. 137 (6):[Medline]. Blum K. Swaddling Plus Stomach, Side Sleeping Tied to Risk for SIDS. Medscape Medical News. Available at http://www.medscape.com/viewarticle/863044. May 09, 2016; Accessed: June 22, 2016. Weber MA, Ashworth MT, Anthony Risdon R, Malone M, Sebire NJ. The frequency and significance of alveolar haemosiderin-laden macrophages in sudden infant death. Forensic Sci Int. 2009 May 30. 187(1-3):51-7. [Medline]. Lazoff M, Kauffman F. Sudden infant death syndrome--Part III: Emergency department approach. Acad Emerg Med. 1995 Dec. 2(12):1077-80. [Medline]. Samuels MP, Southall DP. Child abuse and apparent life-threatening events. Pediatrics. 1995 Jul. 96(1 Pt 1):167-8. [Medline]. Southall DP, Plunkett MC, Banks MW, Falkov AF, Samuels MP. Covert video recordings of life-threatening child abuse: lessons for child protection. Pediatrics. 1997 Nov. 100(5):735-60. [Medline]. Carolan PL, Fernbach KL, Larson SA, Svenson JC. Impact of the 'Back to Sleep' campaign on sudden infant death syndrome in Minnesota. Minn Med. 1997 Mar. 80(3):43-6. [Medline]. Heron M. National Vital Statistics Reports, Volume 56, Number 5, "Deaths: Leading Causes for 2004"; date of publication November 20, 2007. Available at. Centers for Disease Control and Prevention. Available at http://www.cdc.gov/nchs/data/nvsr/nvsr56/nvsr56_05.pdf. Accessed: July 18, 2013. Pasquale-Styles MA, Tackitt PL, Schmidt CJ. Infant death scene investigation and the assessment of potential risk factors for asphyxia: a review of 209 sudden unexpected infant deaths. J Forensic Sci. 2007 Jul. 52(4):924-9. [Medline]. Shapiro-Mendoza CK, Kimball M, Tomashek KM, Anderson RN, Blanding S. US infant mortality trends attributable to accidental suffocation and strangulation in bed from 1984 through 2004: are rates increasing?. Pediatrics. 2009 Feb. 123(2):533-9. [Medline]. Moore BM, Fernbach KL, Finkelstein MJ, Carolan PL. Impact of changes in infant death classification on the diagnosis of sudden infant death syndrome. Clin Pediatr (Phila). 2008 Oct. 47(8):770-6. [Medline]. Pharoah PO, Platt MJ. Sudden infant death syndrome in twins and singletons. Twin Res Hum Genet. 2007 Aug. 10(4):644-8. [Medline]. Hauck FR, Tanabe KO. International trends in sudden infant death syndrome: stabilization of rates requires further action. Pediatrics. 2008 Sep. 122(3):660-6. [Medline]. Dwyer T, Ponsonby AL. SIDS epidemiology and incidence. Pediatr Ann. 1995 Jul. 24(7):350-2, 354-6. [Medline]. Fleming PJ, Blair PS, Bacon C, Bensley D, Smith I, Taylor E, et al. Environment of infants during sleep and risk of the sudden infant death syndrome: results of 1993-5 case-control study for confidential inquiry into stillbirths and deaths in infancy. Confidential Enquiry into Stillbirths and Deaths Regional Coordinators and Researchers. BMJ. 1996 Jul 27. 313(7051):191-5. [Medline]. [Full Text]. Dwyer T, Ponsonby AL. Sudden infant death syndrome: after the "back to sleep" campaign. BMJ. 1996 Jul 27. 313(7051):180-1. [Medline]. [Full Text]. Dwyer T, Ponsonby AL. Sudden infant death syndrome and prone sleeping position. Ann Epidemiol. 2009 Apr. 19(4):245-9. [Medline]. MacDorman MF, Cnattingius S, Hoffman HJ, Kramer MS, Haglund B. Sudden infant death syndrome and smoking in the United States and Sweden. Am J Epidemiol. 1997 Aug 1. 146(3):249-57. [Medline]. Liebrechts-Akkerman G, Lao O, Liu F, van Sleuwen BE, Engelberts AC, L'hoir MP, et al. Postnatal parental smoking: an important risk factor for SIDS. Eur J Pediatr. 2011 Oct. 170(10):1281-91. [Medline]. [Full Text]. Ruys JH, de Jonge GA, Brand R, Engelberts AC, Semmekrot BA. Bed-sharing in the first four months of life: a risk factor for sudden infant death. Acta Paediatr. 2007 Oct. 96(10):1399-403. [Medline]. Tappin D, Ecob R, Brooke H. Bedsharing, roomsharing, and sudden infant death syndrome in Scotland: a case-control study. J Pediatr. 2005 Jul. 147(1):32-7. [Medline]. Mathews TJ, Menacker F, MacDorman MF. Infant mortality statistics from the 2002 period: linked birth/infant death data set. Natl Vital Stat Rep. 2004 Nov 24. 53(10):1-29. [Medline]. Vennemann MM, Hense HW, Bajanowski T, Blair PS, Complojer C, Moon RY, et al. Bed sharing and the risk of sudden infant death syndrome: can we resolve the debate?. J Pediatr. 2012 Jan. 160(1):44-8.e2. [Medline]. Mitchell EA. Recommendations for sudden infant death syndrome prevention: a discussion document. Arch Dis Child. 2007 Feb. 92(2):155-9. [Medline]. [Full Text]. Vennemann MM, Bajanowski T, Brinkmann B, Jorch G, Yücesan K, Sauerland C, et al. Does breastfeeding reduce the risk of sudden infant death syndrome?. Pediatrics. 2009 Mar. 123(3):e406-10. [Medline]. Tonkin SL, Lui D, McIntosh CG, Rowley S, Knight DB, Gunn AJ. Effect of pacifier use on mandibular position in preterm infants. Acta Paediatr. 2007 Oct. 96(10):1433-6. [Medline]. Moon RY, Tanabe KO, Yang DC, Young HA, Hauck FR. Pacifier use and SIDS: evidence for a consistently reduced risk. Matern Child Health J. 2012 Apr. 16(3):609-14. [Medline]. Franco P, Chabanski S, Scaillet S, Groswasser J, Kahn A. Pacifier use modifies infant's cardiac autonomic controls during sleep. Early Hum Dev. 2004 Apr. 77(1-2):99-108. [Medline]. Mitchell EA, Thompson JM, Becroft DM, Bajanowski T, Brinkmann B, Happe A, et al. Head covering and the risk for SIDS: findings from the New Zealand and German SIDS case-control studies. Pediatrics. 2008 Jun. 121(6):e1478-83. [Medline]. Blair PS, Mitchell EA, Heckstall-Smith EM, Fleming PJ. Head covering - a major modifiable risk factor for sudden infant death syndrome: a systematic review. Arch Dis Child. 2008 Sep. 93(9):778-83. [Medline]. Vennemann MM, Bajanowski T, Brinkmann B, Jorch G, Sauerland C, Mitchell EA. Sleep environment risk factors for sudden infant death syndrome: the German Sudden Infant Death Syndrome Study. Pediatrics. 2009 Apr. 123(4):1162-70. [Medline]. Centers for Disease Control and Prevention. Highlights in Minority Health & Health Disparities. October 2006. Available at http://www.cdc.gov/omhd/Highlights/2006/HOct06SIDS.htm. Accessed: July 23, 2013. Krous HF. The microscopic distribution of intrathoracic petechiae in sudden infant death syndrome. Arch Pathol Lab Med. 1984 Jan. 108(1):77-9. [Medline]. Krous HF, Haas EA, Chadwick AE, Masoumi H, Stanley C. Intrathoracic petechiae in SIDS: a retrospective population-based 15-year study. Forensic Sci Med Pathol. 2008. 4(4):234-9. [Medline]. Krous HF, Ferandos C, Masoumi H, Arnold J, Haas EA, Stanley C, et al. Myocardial inflammation, cellular death, and viral detection in sudden infant death caused by SIDS, suffocation, or myocarditis. Pediatr Res. 2009 Jul. 66(1):17-21. [Medline]. Krous HF, et al. Instruction and reference manual for the International Standardized Autopsy Protocol for Sudden Unexpected Infant Death. J SIDS Infant Mort. 1996. 1:203-46. Pryce JW, Paine SM, Weber MA, Harding B, Jacques TS, Sebire NJ. Role of routine neuropathological examination for determining cause of death in sudden unexpected deaths in infancy (SUDI). J Clin Pathol. 2012 Mar. 65(3):257-61. [Medline]. Coleman-Phox K, Odouli R, Li DK. Use of a fan during sleep and the risk of sudden infant death syndrome. Arch Pediatr Adolesc Med. 2008 Oct. 162(10):963-8. [Medline]. Towbin JA, Friedman RA. Prolongation of the QT interval and the sudden infant death syndrome. N Engl J Med. 1998 Jun 11. 338(24):1760-1. [Medline]. Carpenter R, McGarvey C, Mitchell EA, Tappin DM, Vennemann MM, Smuk M, et al. Bed sharing when parents do not smoke: is there a risk of SIDS? An individual level analysis of five major case-control studies. BMJ Open. 2013. 3(5):[Medline]. [Full Text]. Harrison L. AAP updates sleep guidelines for infants to protect against SIDS. Medscape Medical News. WebMD Inc. Available at http://www.medscape.com/viewarticle/870895. October 24, 2016; Accessed: December 7, 2016. [Guideline] Priori SG, Wilde AA, Horie M, Cho Y, Behr ER, Berul C, et al. HRS/EHRA/APHRS expert consensus statement on the diagnosis and management of patients with inherited primary arrhythmia syndromes: document endorsed by HRS, EHRA, and APHRS in May 2013 and by ACCF, AHA, PACES, and AEPC in June 2013. Heart Rhythm. 2013 Dec. 10 (12):1932-63. [Medline]. [Guideline] American Academy of Pediatrics, Hymel KP, Committee on Child Abuse and Neglect, National Association of Medical Examiners. Distinguishing sudden infant death syndrome from child abuse fatalities. Pediatrics. 2006 Jul. 118 (1):421-7. [Medline]. [Full Text]. Frellick M. New AAP Guideline: Brief Unexplained Events in Infants. Medscape Medical News. Available at http://www.medscape.com/viewarticle/862390. April 25, 2016; Accessed: November 17, 2016. 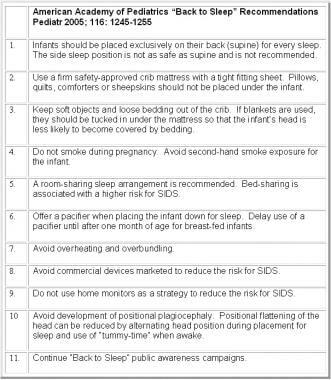 [Guideline] Task Force on Sudden Infant Death Syndrome, Moon RY. SIDS and other sleep-related infant deaths: expansion of recommendations for a safe infant sleeping environment. Pediatrics. 2011 Nov. 128 (5):1030-9. [Medline]. [Full Text]. Changes in incidence of sudden infant death syndrome (SIDS) observed in selected centers worldwide. Last column reflects percentage change in SIDS incidence for years noted. Several key recommendations related to infant sleep position and sleep environment. Sources: American Academy of Pediatrics (AAP), National Institutes of Health and Human Development (NICHD), Consumer Product Safety Commission (CPSC), Association of SIDS and Infant Mortality Programs (ASIP). Adapted from "What is SIDS" monograph published by National Sudden Infant Death Syndrome Resource Center. Teaching Safe Sleep: Are You Giving the Best Advice?